From banana stands to never-nudes to the Aztec Tomb, Arrested Development has some of the strangest gags and characters to ever appear in a TV show. And for its fans, that's what made it great. 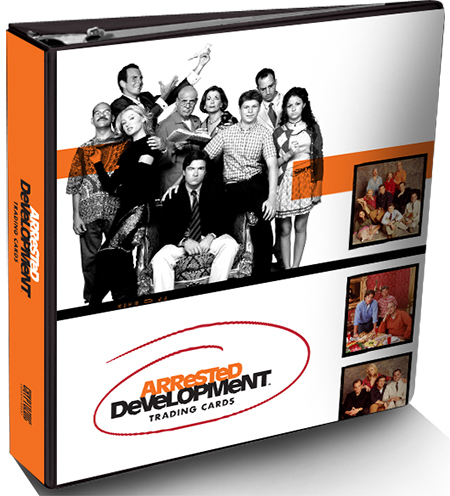 2016 Cryptozoic Arrested Development trading cards mark the first time the cult favorite has been brought over to the hobby. The set focuses on the show's three original seasons plus the fourth that debuted on Netflix in the spring of 2013. Autographs (1:16 packs) are inserted one per box. Cryptozoic is planning for a mix of regular cast members and guest stars. 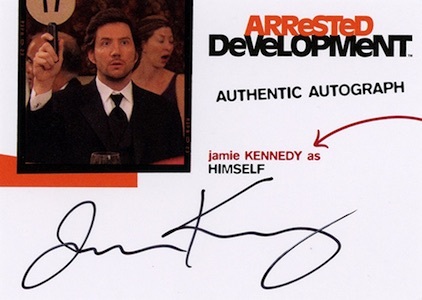 Both Wardrobe cards with costume swatches and Totally Fabricated are also part of 2016 Cryptozoic Arrested Development. Totally Fabricated cards are like traditional memorabilia cards except they use manufactured pieces and are clearly marked as such. Basic inserts include Character Bios (1:4 packs), Cryptomium Symbols, and ID Cards (1:4 packs). Sold separately, a one-inch binder comes with an exclusive card. This is a preliminary checklist and subject to change. The full checklist will be added as soon as it is available. I cannot wait for the release of this set! My favorite show of all time!